Hi, I'm Roman; and this is Mike. How was your inbound marketing week? This week's highlights hand-crafted just for you, straight from the HubSpot oven. Five Simple Ways to Start Growing Your Email List Today - In the Internet world, email has been around seemingly forever. There’s a reason for that. Email works. Email works very well. And with smartphones email is more accessible than ever. Never, ever discount email. Never, ever miss an opportunity to capture an email, especially from live events like conferences and networking events. And be sure to segment your list. Your newest website redesign client doesn’t want to see an email offer for 15% off a website redesign right after inked their own website redesign deal. You Have $100 to spend on Social Media Marketing. Here’s One Way to Spend It. - A nice breakdown of how to spend $100. Take that $100 and think about it as $100,000 or $1,000,000 and it still works on a percentage level. Note the spend on design and and advertising reach - they make up $70 of the $100. Why Videos Make Great Content for Marketing to B2B Software Buyers - We talk about content as a storytelling tool. Videos have the potential to tell the story much quicker than a blog post or whitepaper. A good explainer video can crystallize your value proposition in a minute or two and keep a visitor on your site long enough to become a lead. Inside Warby Parker: How Vision, Mission & Culture Helped Build a Billion Dollar Business - a powerful reminder that even the best marketing efforts should be driven by mission and culture. You can have the best tactics in the world but if they don’t have the foundational backing of a set of core values your goals may not be met. 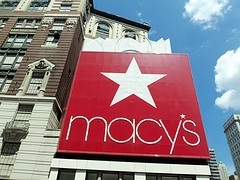 Macy’s narrows gap between marketing, technology to boost omnichannel strategy - Important here is the notion of omnichannel and digital first. Macy’s design focus is mobile first and marketing everywhere. More importantly, everyone should be thinking omnichannel. Why segment your efforts between desktop, mobile and outbound. One channel - omnichannel. It's May! Have yourself a wonderful day!